Sercadis® is a protectant fungicide for the control of apple scab in apples, pear scab in pears and powdery mildew in apples and pears. Sercadis® delivers to you outstanding efficacy at very low dose rates due to the high intrinsic activity of Xemium®. 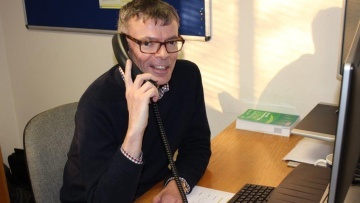 To control diseases effectively, Xemium® must reach its target in the phytopathogenic fungus as quickly as possible. 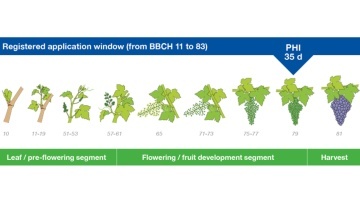 The application window for Sercadis® runs from pre-flowing through fruit development to just before harvest. The robust nature of the product combines long-lasting disease control with physiological benefits for quality top fruit. On both small and large leaves, Sercadis® promotes leaf appearance and ability to function in the most effective way. Both scab and mildew are controlled, resulting in attractive and quality top fruit. Sercadis® is invisible on the plant and delivers strong and long lasting protection along with excellent direct surface protection with unique re-distribution for exceptionally long protection periods. 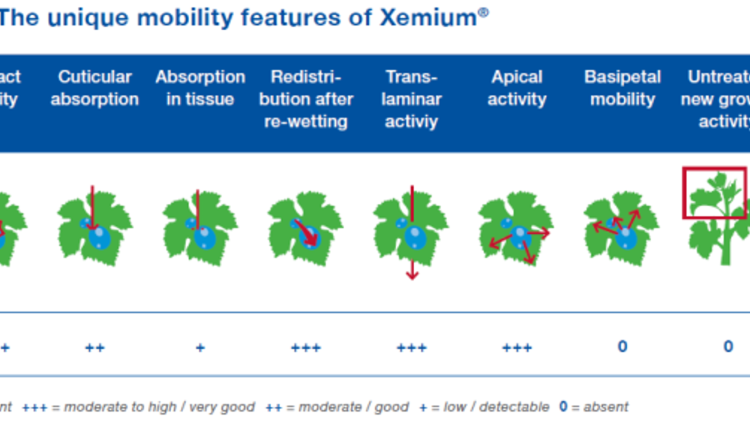 What makes Xemium® special within the SDHI group? is made by BASF – the original SDHI fungicide expert. is the latest generation of SDHI fungicides. has the highest intrinsic activity amongst SDHI fungicides. controls diseases with the lowest dose rates amongst SDHI class fungicides. has a specific flexible molecular structure that empowers optimal disease control. and unique re-distribution properties for long lasting protection. After Sercadis® has dried on the leaf surface, a part of it applied firmly binds into the wax layer, thanks to its lipophilic properties and numerous molecules begin to congregate. 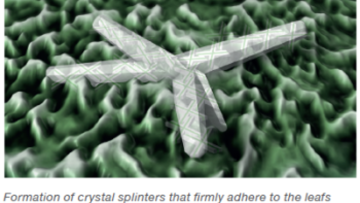 This results in the formation of crystal splinters with bizarre shapes, which adhere firmly to the rough wax layer. Dew or rain mobilizes a small portion of the active ingredient from the crystalline depots. This constant supply of highly mobile Xemium® molecules ensures complete, continuous protection of the plants for an exceptionally long time. For effective disease control, a dense fungicide surface cover is the most efficient way to prevent infections. 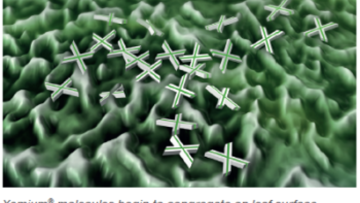 Intense re-distribution properties from Xemium® crystalline depots was found on plant surfaces. Re-distribution is activated by the presence of water and dew, which is often also the driver for fungal disease development. Water and dew do not only support spreading on the surface but also further uptake into wax and leaf tissue. 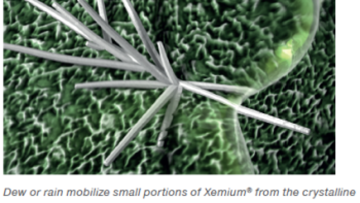 The Xemium® active ingredient is highly mobile once inside the plants and is quickly distributed to other parts. In practical conditions, vine growers should not rely on protection of untreated tissues especially in periods with fast new growth. Repeated applications depending on new growth and disease pressure are recommended. Many relevant mixing partners were tested at field rate in an equivalent water-volume of 100 litre/ha. 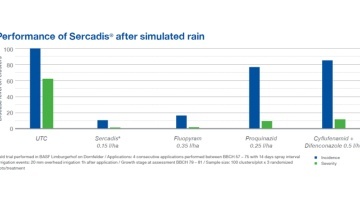 In 30 tested tank mixtures, Sercadis® shows excellent compatibility including Captan. We recommend that Sercadis® is always mixed with an effective Scab Fungicide, for example Delan® Pro. To achieve the best possible results with Sercadis®, the recommended use of the product is preventive. In addition to its superior performance when applied preventively, Sercadis® offers you increased flexibility due to its good disease control under curative conditions. Use of Sercadis® under eradicative conditions is not recommended. In addition to outstanding protection against powdery mildew, Sercadis® also provides incidental control of black rot. Black rot is a well-known disease that is increasingly affecting vineyards in the past few years and Sercadis® can support your better management of the disease. Sercadis® offers you reliable controls in tough weather conditions. Once dry on the leaves Sercadis® has excellent rainfastness that brings to you increased flexibility. With Sercadis® you can enjoy the flexibility of a wide application window. In addition, Sercadis® delivers to you outstanding efficacy at very low dose rates due to the high intrinsic activity of Xemium®. This means for you easier and quicker handling of the product. In an increasingly global world, you want to have the flexibility to promote your produce through multiple food value chains. Your customers often have different needs and requirements. Sercadis® delivers to you superior and long lasting control with only one active. 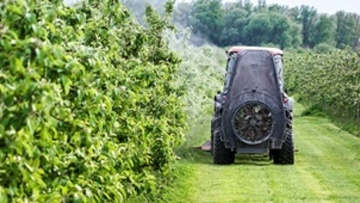 This, results in increased flexibility to design your spray programme in order to meet the demands of your customers. Xemium® is currently being introduced to specialty crop growers worldwide. Trade flow for table and wine grapes, wines and spirits is secured by setting MRLs and import tolerance in the key countries. Sercadis® will be particularly appeal to growers who want the flexibility to produce for export markets.